Dr. Sharon Prentice is the author of Becoming Starlight: A Shared Death Journey from Darkness to Light.Soon after completing her graduate studies in psychology, Dr. Prentice longed to discover “the why’s” about her own intimate experience with death in the form of an SDE, and that of others who had experienced something “weird, unbelievable, odd” at the time of the death of a loved one. Dr. Prentice is in private practice as a Licensed Clinical Pastoral Counselor – Advanced Certification. She is also a Board Certified Spiritual Counselor (SC-C) and holds Board Certification in Cognitive Behavioral Therapy, Group Therapy, Integrated Marriage and Family Therapy, and Crisis and Abuse Therapy. 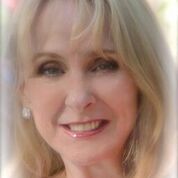 She is also a Board Certified Temperament Counselor. Dr. Prentice is a Professional Member of the American Counselors Association, a Professional Clinical member of the National Christian Counselors Association, a Clinical member of the American Mental Health Counselors Association, and a Presidential member of the American Association of Christian Counselors. She is also a Commissioned Minister of Pastoral Care. For more information, please visit https://sharonprentice.com and follow the author on Facebook and Twitter. 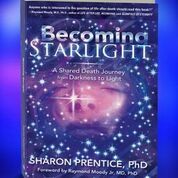 Spiritual Media Blog is running an email drawing for one visitor to win a free hard copy of Becoming Starlight! If you would like to participate in this drawing, please enter your email address in the sign-up box below. One email address will be chosen at random and the person will be emailed to be informed that they won a free hard copy of Becoming Starlight. Then, Spiritual Media Blog will mail the free hard copy of the book to that winner. If you are interested in participating in the drawing, please enter your email in the email sign up box below. All people who enter their email address will also receive a free subscription to Spiritual Media Blog’s weekly online newsletter that contains articles about spirituality, psychology, and inspirational entertainment. The drawing is limited to US entries only and ends October 15.